Iran has begun operations at two uranium extraction mines and a new uranium production facility, the country’s state television reported. The new Iranian nuclear facility in the city of Ardakan and the newly operational Saghand uranium mines are located about 120 km apart in the country’s central province of Yazd , the report said. The report gave few details on the new sites: the mines are 350 meters deep, and the Ardakan facility has an estimated annual output of 60 tons of yellowcake. Yellowcake is an impure state of uranium oxide used in uranium enrichment. The launch coincided with Iran’s National Nuclear Technology Day. President Mahmoud Ahmadinejad ordered the launch via a video conference. The Saghand mine is estimated to hold a total reserve of 1.58 million tons of uranium ore. In 2003, Iran announced its intention to open the facility, and in 2004 informed the International Atomic Energy Agency (IAEA), the UN nuclear watchdog. Ore production was initially expected to start by the end of 2006, but was delayed. The yellowcake production plant at Ardakan was a pilot-scale site, which Iran expanded into an industrial-scale milling facility. The plan was first leaked to the public in 2003 – the plant was expected to become operational in 2009, coinciding with the rescheduled launch of the Saghand mine. The Islamic republic’s nuclear program is the subject of a major international row. Some countries, including the US, have claimed that Tehran is using the program as cover to secretly build a nuclear weapon. 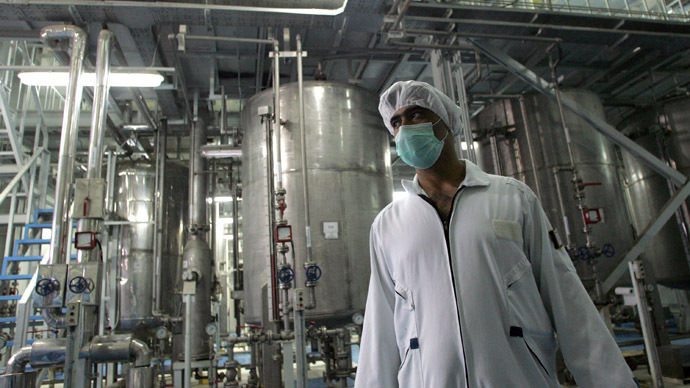 Iran maintains that its nuclear endeavors are purely civilian and are needed to produce energy, as well as isotopes for research and medical devices. Last year, Washington and its allies rolled out crippling sanctions targeting Iranian oil exports, saying the measures are needed to pressure Tehran into shutting down its uranium enrichment. Iran’s economy suffered under the sanctions, but the country said it will not surrender its right to a peaceful nuclear program. Iran and a group of international negotiators known as the P5+1 held their latest round of nuclear talks in Kazakhstan last week. The meeting failed to produce a breakthrough and reduce tensions. The news of the new facility’s launch may be Tehran’s response to the failed round of nuclear negotiations. Earlier on Monday, a leading Iranian lawmaker warned that his country may consider withdrawing from the Nuclear Nonproliferation Treaty (NPT) if the pressure continues. Alaeddin Boroujerdi said Iran may do so because it is being punished by the US for exercising its nuclear rights as an NPT signatory, giving Tehran little incentive to continue following the treaty.